Isaac-cannot agree more for the need to make Kashrut a truly communal organisation. I sincerely believe that the community would be far better served .Alas, parochial interests driven by monetary considerations are the major obstacle. The same situation exists in NSW. This in turn opens the doors for other parties like Kosher VeYosher to enter this space and pander to the community’s desire to offer more variety at the expense of lower standards .Indeed-with no proper regulation, anyone can purport to enter the kashrut space. Kosher VeYosher has identified a niche and if it concnetrated on providing a service without controversy and confrontation-it could make serious inroads. In this regard, there was a Govt Inquiry into labelling-covering all food products. The ECAJ in consultation with ORA recommended that Kashrut be self regulated-this in my view is dangerous.Imagine if we had a single governning authority that supervised hechsherim and certified who can and cannot be relied upon. This is something that in the absence of being able to persuade the relevant jashrut authorities to unite under a single roof-which would be the preferred outcome-would provide the next best solution. I’m not at all sure about the LBD/Sydney vis a vis standards issue. It’s just a feeling I have based on some products and what might be a difference of opinion. The point is that Melbourne can be an example here. We should adopt a kashrus policy, and it should also be the same in Sydney in my opinion (and all over Australia). I’d go as far as saying that we should formally affiliate with the OU which would then allow us to have OU on Aussie products and (if and when the dollar comes down) give more transferable traction to Aussie food producers. It need not be Gutnick vs Gutnick. It would be better if we simply affiliated with a world known and respected standard, and that standard, at least in my opinion ought to be the OU. Fully agree. Kashrus in this city should be a communal asset, self-sufficient and governed by a representative group of independent and suitably qualified Orthodox stakeholders. It must recognize the role of Mizrachi in establishing, operating and subsidizing it for many years. However, it’s time that this organization was shifted to where it belongs. Although only in recent years Ko-sher Australia has stopped trading at a loss, Mizrachi still does not charge rent. Over the years, this project has cost Mizrachi over a million dollars and appeals to the wider community have fallen on deaf ears. The community is happy to use our services but not the slightest bit interested in helping to pay for it. In fact there is a perception in some quarters that our appeals are bogus, because it is believed that Kashrut is a cash cow, and some groups even eye it covetously. Mizrachi is not prepared to give it up to another body unless we get a reasonable compensation for the huge sum expended AND that we are confident that the high Kashrut standards that have been es- tablished will not be compromised. I find this statement rather sad and negative. More importantly, it does not respond to the clear fact that Mizrachi offered to give it up, and that Mizrachi alone decided that it would continue to bear the expenses, once it changed its own mind and decided it wanted to keep Kashrus. Perhaps Dr Kloot could also insist that all members of Mizrachi actually use caterers who are under Kosher Australia, exclusively. In fact, we all should, in my opinion. We all owe Mizrachi our thanks for their outstanding work in enhancement of Kashrus – whether as Mizrachi Kashrut, Melb Kashrut and now using the coveted KA tag (which they share/compete with Sydney). What I do wish to point out to Isaac and anyone else who would prefer a single Kashrus authority, check out what is happening in Sydney, where that KA has a monopoly. The caterers pay double (if not more) fees than those in Melbourne. Kosher meat is far more expensive there. The only reason for that is – lack of competition. Melbourne consumers should be pleased that that there exists Adass Kashrus which ensures that our KA keep their charges reasonable. There were a whole bunch of posts on this topic some time ago in AJNWatch, when a Melb (Adass – but it could have been a KA) caterer was asked to do a wedding in Sydney. Understandably Reb Moshe Gutnick almost went ballistic. But the baalei simcha were thrilled. Despite the extra costs of bring staff and food from Melb, they paid less than half of what Sydney caterers had quoted. OTOH, I too appreciate that having a single authority has many positive effects, but only if everything – including standards and especially finances – are completely transparent and with guarantees of no price-gouging and exploiting of caterers and food establishments by that organisation. As far as Kosher veyosher is concerned, they sure do some strange things. But I have reliably been told that its target ‘audience’ is defintely not the Chabad or the Charedi crowd, but rather that segment of the Mizrachi shul types (and I don’t mean davka Mizrachi – but also those that are in the US labeled as ‘MO-lite’ who have no problems in frequenting non-Jewish fish and vegetarian establishments and/or non-Jewish cafes etc for a coffee and even a tuna sandwich etc. Such people – given the option – may however, go to a supervised place – if conveniently located. (Lord of Fries is one example.) 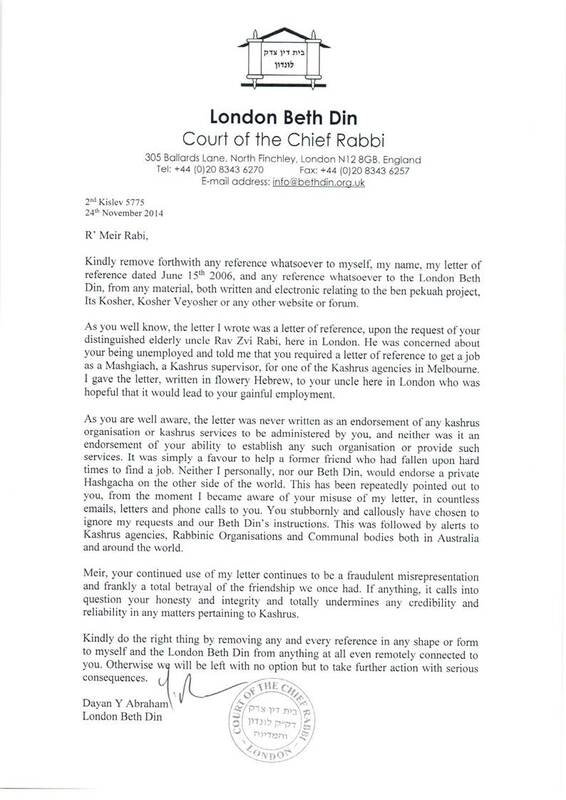 Thus, in his way, Rabbi Rabi is actually offering a service which KA or Adass couldn’t and wouldn’t do. KV also supervisies Sanitarium which is rumored not to have been visited by either of the KAs for a number of years. (Though their products were listed in the directories.) This may well be incorrect information and I would be happy to hear it denied. I discussed this post with a rabbi friend in the US who said that he was under the impression that the CRC of Satmar (and their Kashrus wing) was established prior to the cRc of Chicago. Maybe someone can confirm or deny this. I don’t think Adass does anyone outside of Adass any kashrus favor or any favors. They live for themselves and all interaction with non Adass is purely to rake in money. Take that away and they would never cater for non frum functions! I don’t believe having a central body will drive costs up as long as finances are controlled by a lay representative body such as the COSV and transparent. I don’t believe Kosher Vyosher serves anyone except itself and its business partners. it is a poor man’s Rav Abadi hechsher, except it’s not run by someone in the same league as Rav Abadi. Those who eat at questionable places will not now exclusively go to KvY establishments alone.They will continue to eat trayf. Melbourne is mature enough to adopt OU standards. I don’t believe Rabbis should have their own kashrus fiefdoms where they are effectively entrepreneurial hechsher printers who pocket money with these businesses. I am currenty in Israel, interesting to note how many Kashrut authorities and symbols they have here. Isaac remembers correctly when I represented Mizrachi at the COSV many years ago there was a discussion of the possibility of the COSV taking over the management and operations of what was then The Mizrachi Kashrut Authority and today is Kosher Australia. At no time was this to be a hand over, I said it then, continue to believe it today that the Mizrachi Organization is entitled to and should receive fair compensation for the investment it has made into the development and the continuation of Kosher Australia for the benefit of the Jewish Community of Melbourne. As a past Chairman of Kosher Australia and Treasurer of the Mizrachi Organization, let me reassure you all kashrut is not a cash cow, if today it breaks even, I would be surprised, the accounts are presented each year at the Mizarchi AGM, these are available for analysis, they may show a minor profit but as Dr Peter Kloot has stated Kosher Australia receives the infrastructure support of the Mizrachi Organization free of charge, if the real costs were recorded or had to be found it would be far from profitable. As Chairman I invited all Melbourne Synagogues to become part of Kosher Australia, to contribute towards the operations to have representatives on the board, this was unsuccesful. Mizrachi was instrumental in establishing the Melbourne Eruv, when the COSV took over and became joint managers of the Eruv Mizrachi received compensation for its investment there is no logical reason why the same principal should not apply here. As a valuable asset that Mizrachi established in the first instance for its membership it has become and developed into a excellent community service for the benefit of the Melbourne Community. If the COSV feels it is the right body to manage the operations I would suggest they analyse the published Kosher Australia accounts then prepare a Business Plan setting out very clearly where they will get the seed capital and then the operational capital to take over and manage the operations. Included in this plan they will of course need to recognize in a monetary form a sum to represent the investment the Mizrachi Organization has made to date. Until the COSV is able to establish that it is a financially viable organization, that it has the financial infrastructure the management expertise and the financial support of all the Melbourne Synagogues Kosher Australia is best left where it is. When the COSV can publicly show it has the financial where with all, they can approach Mizrachi I am certain that as a financially responsible organization Mizrachi would look at all fair proposals. Of course there can be no expectation that Mizrachi should continue to financially support the COSV during a hand over period. Unless the COSV is able to do so if they take it over we may end up with no Kosher Authority. Thanks for your comments John. Hope you are enjoying Israel. I’m jealous. I remain in the dark, however, as to why your then offer was withdrawn, just as the COSV had decided that it would take over Mizrachi Kashrut (as it was then). As I recall, your words to the COSV were simply that the Mizrachi Board had decided to withdraw its offer. It was very curious at the time, given your strong speech at the previous meeting wherein you expressed the view that Mizrachi wanted to give it up. There was no mention back then about the state of the COSV’s finances. If anything the COSV seemed to have a good strategic plan. At no time, do I recall you saying that the reason Mizrachi had changed its mind was because the COSV had been unwilling or unable to recompense Mizrachi, although I to recall you mentioning compensation when you tabled the proposal. Of course, back then, the investment by Mizrachi was a lot less than now. What I find, curious, between the lines of your comments and those of Dr Kloot, is that even if Mizrachi was compensated, there is a clear lack of confidence in the COSV. I’d suggest that if that was indeed true, that Mizrachi used its talents to bolster the COSV. A strong Mizrachi is important for the community, but I’d suggest a stronger COSV was even more important. I guess i am Nogeya BaDavar as past and now acting President of COSV. What I have endeavoured to introduce into our community is to see proper corporate governernance, transparency and accountability. This now exists in relation the the Melbourne Beth Din and discussions are commencing in NSW to see if a similar structure can be done in relation the NSW Beth Din. Similarly, the same kind of structures are necessary for Kashrut-even more so than the MBD as kashrut has a daily impact on our lives whereas Chas ve chalila we need to resort to a BD for a Get etc. I am familiar with Mizrachi’s arguments-they are lame. Whereas there is no chashash that there is personal gain for Kosher Australia ne Mizrachi Kashrut (KA)-there is the motive for profit. This alone has to raise concerns as to whether the community is receiving the optimum services for Kashrut. By using the KA moniker-Mizrachi have taken kashrut outside their daled amot and made it a communal service. Adass dont pretend to do anything but use kashrut to raise as much money from the kehila as possible. Mizrachi try to create the veneer of being a true communal service. Whereas I in know way criticise the bona fides of KA-I just belive that under a true communal body where it is required to report to and be accountable to, the community will have more confidence. In terms of a solution, I do not see a need to undertake a major overhaul-there is no reason why the exisitng infrastructure of KA cannot remain in place with the exception that it reports to the COSV rather than Mizrachi. In return, the COSV will through its membership allow for greater penetration of KA to the wider community-eg make it compulsory for all its memebers to ensure that KA booklets are in every home rather than the current subscription base. I also believe that commercial opportunites will open up by going truly communal. The same applies in NSW. Bottom line-there is no impediment to placing KA under a roof body and outsourcing the managemet of KA to the existing management with the sole change that it reports to the community. Financially, Mizrachi could receive some form of ongoing “management fee” on the basis that it stacks up.-and I believe it can. Without entering into this broader subject I want to point out that in the very opening paragraph on this matter you were kind in crediting the Mizrachi organization for their work on behalf of Kashrus in Australia. You also mentioned Rav Abaranok ז’ל who was indeed an inspiration not only to Mizrachi or the Kashrus side of things but to the entire community and all who knew him. Also Rabbi Mordechai Gutnick who has brought tremendous knowledge and credibility to the organization. But in commenting on Mizrachi Kashrus, through its many leaders, Rabbonim and supporters it is remiss not to mention Kasriel Oliver who is the longest serving employee, having been there for over thirty years. That’s a lot of devotion and time and all in an incredibly integral and professional manner. The entire face of Kashrus in Australia would look very different were it not for Kasriel who had a much more promising and profitable career beckoning and had begun studies for that career when at the suggestion of the Lubavitcher Rebbe זצ”ל via Rabbi Groner ז”ל he gave it up to study food chemistry for several years. I agree. I was somewhat (over) Rabbinically focussed 🙂 Certainly, Kasriel has been a great resource for the community. Apologies to him! It would also be nice if KA would be modernised….out there on the web. Accessible to all, both visitors to Australia and to those just taking baby steps in kashrut and wanting the proper information. Their website hasn’t been updated in 3 (or maybe 4) years. Information is only via a cumbersome book, where updates need to be stuck in. Even their digital version doesn’t automatically ‘correct’ itself when there are changes. Money could still be made by charging a (lesser) subscription fee to log on. I know many kashrut-observant Jews who do not bother buying the book…relying on others and the kosher stores, but would more likely purchase an ‘online’ subscription. While you make good points, I’m a bit bothered by the assumption that the OU is the gold standard of kashrus, and that whatever psokim and policies it adopts should automatically be adopted by / imposed on Melbourne. As I understand it R Belsky is the OU’s official posek, while R Shachter, as the rebbe of many of the OU’s decision makers, serves unofficially as a second opinion; but with all due respect to both, they are not the poskei hador, and one is permitted to disagree with them, both lekula and lechumra. Now one may legitimately believe that R Abramson and R Aboranok were lenient out of necessity, and that had the kosher market in their days been what it is today they would have ruled more strictly, and therefore that we should adopt stricter psokim now that we can. Perhaps this is what R Mordechai Gutnick truly believes. But one may also maintain, as I think R Moshe Gutnick does, that they paskened as they did because that was really how they held, and therefore that there is no halachic reason to pasken more strictly today just because the OU does. On the contrary, one may see the abandonment of the local psokim in favour of the OU’s as a purely commercial decision, in order to gain the OU’s recognition and thus penetration into the USA market. And one may see in it an inferiority complex that assumes what is done in America or Israel must be better than what is done here. I do personally do consider R’ Schachter to be one of the Poskei HaDor, without any doubt. I have a post waiting from R’ Gutnick in Sydney which explains the Sydney approach. It isn’t about abandoning kulos (leniencies) nor is it about abandoning Psak and handing over all decisions to the OU. Romy, there is no value in reviewing the past, if my memory serves me correctly the issue then and the issue now will be basically the same. Will the COSV reimburse the Mizrachi Organization the enormous financial investment it has in Kosher Australia. I find your remarks with regard to transparency surprising you are a member of Mizrachi you have been a member of the Committee, if not now, you have access to the financial accounts these are audited, I find you profit motive comment lacking substance. Mizrachi is transparent and is accountable to is members of which you are one, if you are so passionate about transferring it to the COSV then may I suggest you raise it at the AGM as a Member you have a vote and you can move a resolution. Although before you do that make sure the COSV has the capacity and the ability to fund Kosher Australia. Romi, you have two accountants on your board put together the Business Plan as I previously suggested do the numbers, then approach Mizrachi. you take the easy option let the Mizrachi Organization do the work, change the ownership to the COSV and pay a management fee to Mizrachi, based on my professional experience and knowledge of Kosher Australia and its figures your plan would not be financially viable. From what I understand the COSV has financial constraints currently, not all its constituents pay full fees and those that do have varying fees vary between synagogues, in addition to the simple fact that there a substantial number of Melbourne synagogues that are not members of the COSV. May I suggest forget about building kingdoms, get your own house into order, get all Melbourne Synagogues to join the COSV, make sure they all pay the same fees, then prepare the Business Plan put it on the table and make an offer to Mizrachi , I am confident they will look at it, till you are able to do so may I suggest leave it alone Kosher Australia is doing a wonderful job, the COSV will not do not do better. In conclusion let me make quite clear at no time did I as the Mizrachi Representative to the COSV offer on behalf of Mizrachi to give it up it was open to discussions about the possibility of it being taken over by the COSV if it was feasible and Mizrachi received reasonable compensation, I am of the same view today, although based on my knowledge of the COSV and its current operation I am not confident that it could manage or take over the operations of Kosher Australia. I have found the NSW KA site with its online Kashrus directory very helpful – especially when I am away from home and don’t have any lists with me. Re my (and Isaac’s earlier comment) I think you are fooling yourself if you think that KA Kashrus charges – especially for caterers would not be far higher – if not for Adass being around. Check out Sydney’s charges and you’ll be shocked. Up to $6.73 per person (plus mashgiach fees). To the best of my knowledge a Melbourne Adass caterer adds a $2 p.p. charge for Adass hashgacha. There is much I can say based on what I see vis a vis Kashrus at functions. I have 25 years of experience observing. I’m not sure how to say it though without being possibly libellous. There are differences in quality. That’s all I will say. Of course there is much to be said about kashrus, as indeed there is about Another aspect at weddings which should be addressed is the eardrum-shattering, earsplitting and piercing racket that the musicians feel they must deafen the poor guests with (while they themselves have earplugs!). While I could put up with it in my 20s, in my 50s it is unbearable. Sigh. When and if I play for you or your children, you will have control of volume and indeed sound engineering options. I take my advice from B’aalei Simcha. End of Discussion. There is an organisation which is where the kashrus authorities get together and decide on various standards to keep. They also ensure that member hechsherim keep to their standards. It is the AKO. It is not only the OU, but all the big names in Kashrus. May I suggest that we stick to the topic, that is the availability of product, the labeling of product, the standard and quality of the Kashrut service the community receives as Isaac has clearly stated the sound of the music doesn’t impact on the kashrus of a function. Kosher Ausrralia has achieved an enormous amount in improving the the range and availability of product where it has unfortunately failed is that it has been unable to dramatically increase the range of product that has the KA logo making it easily recognizable for the shopper. Carrying a booklet checking serial numbers etc etc makes it extremely difficult for the shopper, Of course there are many success in this area but that is where they should be concentrating their efforts. The vegans and other religions that are able to rely on our symbol are numerous, all you need to look at is the increase of the Halal label on products and you can readily establish where they concentrated their efforts. Kosher Australia where around long before the Halal label was seen on product, they have succeeded where we have failed. Marketing our label and the benefits it provides both from a national and international basis is what we should concentrate on, the producers from what I remember have no real feel for the actual size of the Kosher Market, if we were able to convince them succesfully of the benefit of the label, together with the advantage to the non Jewish market of this label we would move forward in leaps and bounds, I recognize that Kosher Australia tries to achieve this, the volume of the music at functions would still be irrelevant to the topic of the discussions re Kashrus. I have followed the workings of Kashrus here and also while living overeas (e.g. U.S.A.). Kosher Aust have quite a way to go, to reach the level of the O.U. Privately maybe be different story. Kashrus favours first. Who does do Kashrus favours for others. Kosher Australia? Aren’t they about raking in money from others? Their Kashrus book costs more than any other, by 3 to 4 times as much at least(LBD £10= $16). You can hardly get any info on the internet unless you pay-at least Syd KA give it free). I am not trying to bag KA, just that you have no right to bag Adass for something that every Kashrus org does. And then you go on about any favours. What about Hatzolo? Who started that? Who did all the grounding hard work, before others joined? Was that just for Adass? They have a Kollel baale batim, where others come. Bikur Choilim. Their Rabbonim-and especially R Heimlich-is constantly asked shaalos from outside. Rav Beck is constantly-quietly-helping others. The list goes on. You also go on about honest reporting. At the begining of this post you have a go at CRC for copying the cRc name. When someone brought up that CRC were first you didn’t apologise or even admit you may be wrong. You can’t compare Kosher Australia to Adass of course. The latter is a small scale largely irrelevant kashrus agency, which is only designed to exist to cater to its OWN community and its private caterers. You know the difference, surely. KA has apparently just started making a small profit. Hatzala is a great organisation, but the less extreme Adass people on it the better we will all be. The one witnessed refusing to tend to a choking woman because she was a Goy washing the dishes in a Jewish house on Yom Tov was a chilul hashem of the highest order. His “less frum” partner had to do almost everything and was visibly annoyed with his Charedi colleague. I won’t go on about other things Adass, but they do them for their Kehilla, It’s their right. The rest is just accidental. As for the CRC, I haven’t seen evidence of them using CRC on labels before cRc. Do you have any evidence of that sort? Sorry, but every Kehillo does for themselves and the rest is incidental. There is nothing to show otherwise. To say that KA is great and Adass nothing is completely off topic and has nothing to do with this(although you may be surprised how many outside Rabbonim and lay people rely on Adass in Melb and Syd). Also bringing up this story with the Adassnik in hatzolo(I will take your word for it), no person or org is perfect, and once one starts with individual negative stories, there is no hechsher or any type of org that is so clean, that people from both sides cannot find what to throw mud at. The fact is that Adass were the Nachshon of hatzolo, and you haven’t even given credit for that. Ahem. You brought up Hatzolo! You kept arguing that Adass Kashrus was really a communal thing and you are the one who attempts to tell us all by inference that they are not separatists whose main concern is themselves. I said that was fine. Next Next post: Is the main Chabad Shule in Melbourne moving to the right?